New Hampshire. Registrar of Vital Statistics, Index to deaths, early to 1900, Salt Lake City: Filmed by the Genealogical Society of Utah, (1974) Microfilm #1001068 of the Family History Library, Salt Lake City, Utah, Microfilm #1001068 of the Family History Library, Salt Lake City, Utah: Index to deaths - Colburn to Conway , certified by Frank Johnson, clerk of Goffstown. Frances married Joseph Henry Mercier. Massachusetts Death Index, 1970-2003 [database on-line], Provo, UT, USA: MyFamily.com, Inc., (2005) , Certificate: 008753. 1900 United States. Census Office. 12th census, 1900 population census schedules, Washington, District of Columbia: Bureau of the Census Micro-Film Laboratory, ([197-]) , NEW HAMPSHIRE > HILLSBOROUGH > GOFFSTOWN, Series: T623 Roll: 947 Page: 75. "United States, World War II Draft Registration Cards, 1942," index and images, FamilySearch (https://familysearch.org/pal:/MM9.1.1/V12K-4VP : accessed 28 Oct 2012), Harry Oscar Merrill, 1942; citing NARA microfilm publications M1939, M1936, and M1937; FHL microfilm 2251512. "United States World War II Army Enlistment Records, 1938-1946," database, FamilySearch (https://familysearch.org/ark:/61903/1:1:K85Y-KK9 : 5 December 2014), Frank H Jr Merrill, enlisted 08 Oct 1942, Boston, Massachusetts, United States; citing "Electronic Army Serial Number Merged File, ca. 1938-1946," database, The National Archives: Access to Archival Databases (AAD) (http://aad.archives.gov : National Archives and Records Administration, 2002); NARA NAID 126323, National Archives at College Park, Maryland. 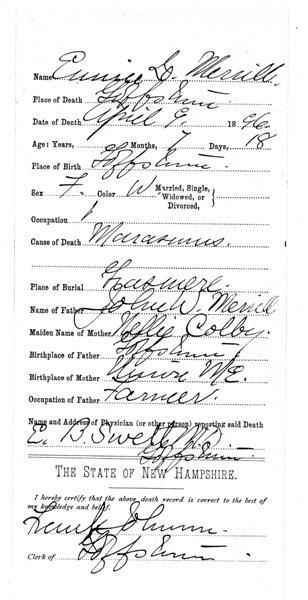 "Massachusetts Births, 1841-1915", database with images, FamilySearch (https://familysearch.org/ark:/61903/1:1:FXVM-PV8 : 1 March 2016), Frank H. Merrill, 1911.
living at 9 Trask St., Danvers, Massachusetts. living at 45 Rich Street, Waltham, Massachusetts. "New Hampshire, Marriage Records, 1637-1947," index and images, FamilySearch (https://familysearch.org/pal:/MM9.1.1/FL8L-31G : accessed 28 Oct 2012), Harry Oscar Merrill and Eva Mae Staples and null, 1909. 1910 United States. Bureau of the Census. 13th census, 1910 population census schedules, Washington, District of Columbia: Bureau of Census Micro-Film Lab, ([19--?]) , Census Place: Danvers, Essex, Massachusetts; Roll: T624_581; Page: 9A; Enumeration District: 0279; Image: 501; FHL microfilm: 1374594. World War I Draft Registration Cards, 1917-1918, at http://content.ancestry.com, Registration State: Massachusetts; Registration County: Middlesex; Roll: 1674460. 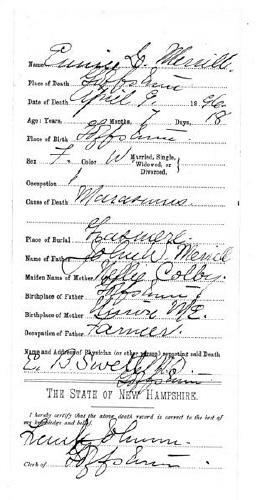 George Levine entry, Cerificate of Birth (Registered Feb. 23, 1903, corrected 3-19-42), Town Clerk, Franklin, Massachusetts. 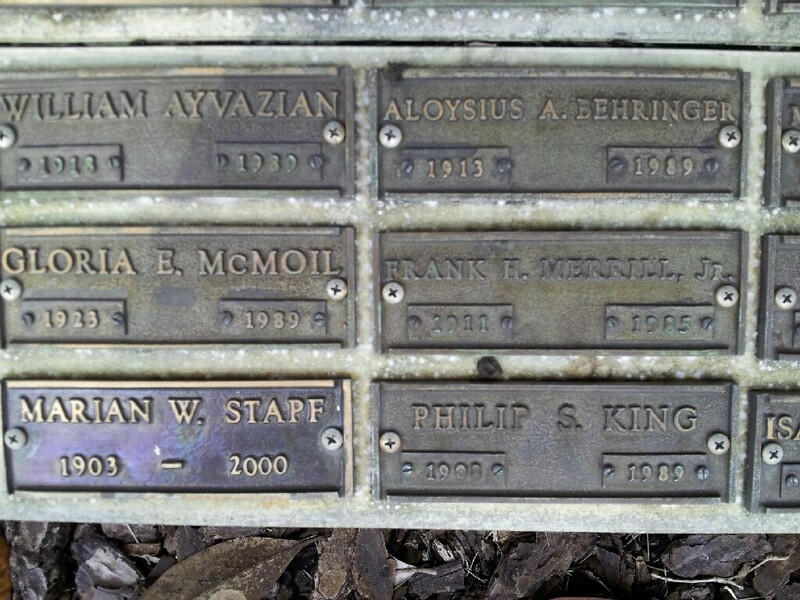 Massachusetts Death Index, 1970-2003 [database on-line], Provo, UT, USA: MyFamily.com, Inc., ((2005)) , Certificate: 041248.
living at 40 High Street, Danvers, Massachusetts. Merrill, John W (Nellie A) house 66 High. 1880 United States. Census Office. 10th census, 1880 federal population census, Washington, District of Columbia: National Archives and Records Service, ([19--]) , Census Place: Beverly Ward 3, Essex, Massachusetts; Roll: T623 640; Page: 7A; Enumeration District: 259. "New Hampshire, Marriages, 1720-1920," index, FamilySearch (https://familysearch.org/pal:/MM9.1.1/FDLX-XR4 : accessed 14 Dec 2012), John W. Merrill and Nellie A. Colby, 17 Nov 1880; citing reference 2:1FH75Z9, FHL microfilm 1001284. New Hampshire. Registrar of Vital Statistics, Index to deaths, early to 1900, Salt Lake City: Filmed by the Genealogical Society of Utah, (1974) Microfilm #1001068 of the Family History Library, Salt Lake City, Utah, Index to deaths - Colburn to Conway , death of Caddie B. Merrill, 1884, certified by Irving A. Watson, Registrar of Vital Statistics. New Hampshire. Registrar of Vital Statistics, Index to births, early to 1900, Salt Lake City: Filmed by the Genealogical Society of Utah, (1974) Microfilm #1000378 of the Family History Library, Salt Lake City, Utah, birth of Herman Merrill, 1888, certified by Irving A. Watson, Registrar of Vital Statistics. New Hampshire. Registrar of Vital Statistics, Index to births, early to 1900, Salt Lake City: Filmed by the Genealogical Society of Utah, (1974) Microfilm #1000378 of the Family History Library, Salt Lake City, Utah, birth of Harry O. Merrill, 1891, certified by Frank Johnson, clerk of Goffstown. New Hampshire. Registrar of Vital Statistics, Index to births, early to 1900, Salt Lake City: Filmed by the Genealogical Society of Utah, (1974) Microfilm #1000378 of the Family History Library, Salt Lake City, Utah, birth of Ralph Merrill, 1892, certified by Frank Johnson, clerk of Goffstown. New Hampshire. Registrar of Vital Statistics, Index to births, early to 1900, Salt Lake City: Filmed by the Genealogical Society of Utah, (1974) Microfilm #1000378 of the Family History Library, Salt Lake City, Utah, birth of Eunice C. Merrill, 1895, certified by Frank Johnson, clerk of Goffstown. New Hampshire. Registrar of Vital Statistics, Index to deaths, early to 1900, Salt Lake City: Filmed by the Genealogical Society of Utah, (1974) Microfilm #1001068 of the Family History Library, Salt Lake City, Utah, Index to deaths - Colburn to Conway , death of Eunice L. Merrill, 1896, certified by Frank Johnson, clerk of Goffstown. 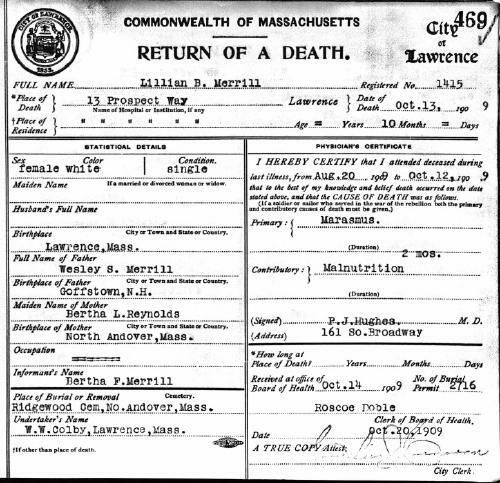 "New Hampshire, Death Records, 1654-1947," index and images, FamilySearch (https://familysearch.org/pal:/MM9.1.1/FS25-26R : accessed 07 Nov 2012), Caddie B Merrill, 19 Sep 1884. New Hampshire. Registrar of Vital Statistics, Index to births, early to 1900, Salt Lake City: Filmed by the Genealogical Society of Utah, (1974) Microfilm #1000378 of the Family History Library, Salt Lake City, Utah, FHL Film Number: 2168794. New Hampshire. Registrar of Vital Statistics, Index to births, early to 1900, Salt Lake City: Filmed by the Genealogical Society of Utah, (1974) Microfilm #1000378 of the Family History Library, Salt Lake City, Utah, certified by Frank Johnson, clerk of Goffstown. "New Hampshire, Births and Christenings, 1714-1904," index, FamilySearch (https://familysearch.org/pal:/MM9.1.1/FDF2-79N : accessed 27 Oct 2012), Merrill, 31 Mar 1892; citing reference Item 4, p, FHL microfilm 2168794. New Hampshire. Registrar of Vital Statistics, Index to births, early to 1900, Salt Lake City: Filmed by the Genealogical Society of Utah, (1974) Microfilm #1000378 of the Family History Library, Salt Lake City, Utah, birth of Angus Merrill, 1897, certified by Frank Johnson, clerk of Goffstown. New Hampshire. Registrar of Vital Statistics, Index to births, early to 1900, Salt Lake City: Filmed by the Genealogical Society of Utah, (1974) Microfilm #1000378 of the Family History Library, Salt Lake City, Utah, certified by clerk of Goffstown [name illeg.]. 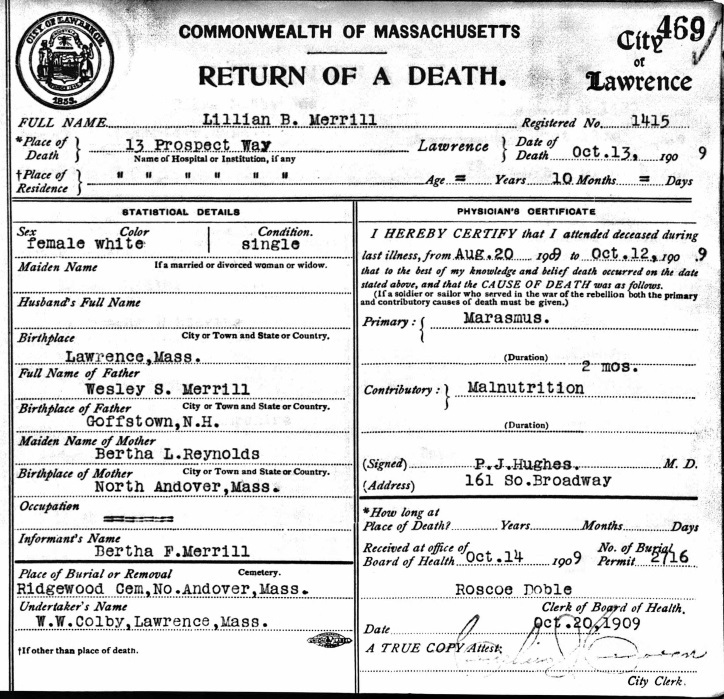 "Massachusetts State Vital Records, 1841-1920," database with images, FamilySearch (https://familysearch.org/ark:/61903/1:1:23T5-KPN : 4 December 2014), Lillian Pearl Merrill, 11 Aug 1916; citing Birth, Danvers, Essex, Massachusetts, United States, certificate number 108, page 471, State Archives, Boston. "New Hampshire, Births and Christenings, 1714-1904," index, FamilySearch (https://familysearch.org/pal:/MM9.1.1/FDF2-SMS : accessed 07 Nov 2012), Merrill, 11 Apr 1881; citing reference Item 3, p, FHL microfilm 2168794. 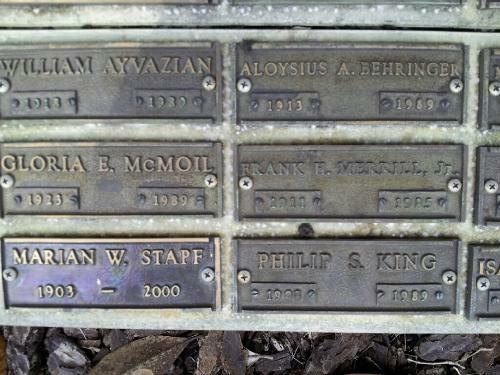 Merrill, Ralph C. removed from town. 1920 United States. Bureau of the Census. 14th census, 1920 population census schedules, Washington, District of Columbia: The National Archives, ([193-?]) , Census Place: Danvers, Essex, Massachusetts; Roll: T625_689; Page: 6B; Enumeration District: 28; Image: 647. "United States Social Security Death Index," database, FamilySearch (https://familysearch.org/ark:/61903/1:1:JP3Q-T2D : 19 May 2014), Theresa E Fiske, 05 Aug 1987; citing U.S. Social Security Administration, Death Master File, database (Alexandria, Virginia: National Technical Information Service, ongoing).